The inquiry into the Little India riot which erupted after 40+years of peace exposes the inadequate police force. The expose will certainly wake up those blind supporters of the hybrid regime. Actually the evidence of insufficient police amid the rising crime brought about by population explosion of foreigners many of whom are from less developed nations & the increasing economic hardship(wage suppression & loss of jobs) suffered by locals are easily seen. 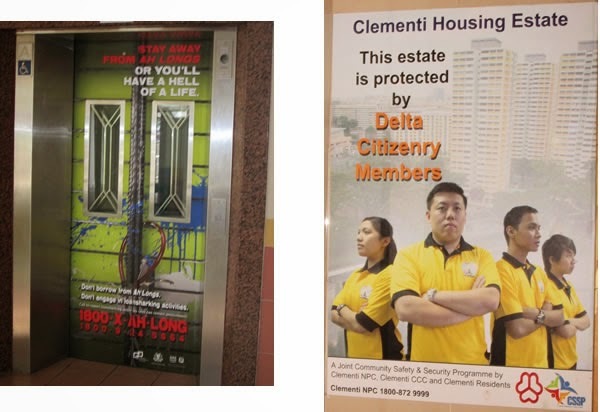 Lift doors plastered with warning advertisements of Ah Long (illegal loansharks) are common at peasant dwellings. We've seen well paid civil servants charged with corruption after being laden with gambling debts at the casinos. The police are unable to eradicate the Ah Long scourge. To cope with insufficient manpower, the police asked for citizen volunteers to patrol the neighborhoods. Look at how smart the hybrid regime is by asking for free labor so they can laugh their way to the bank. Professional thief. 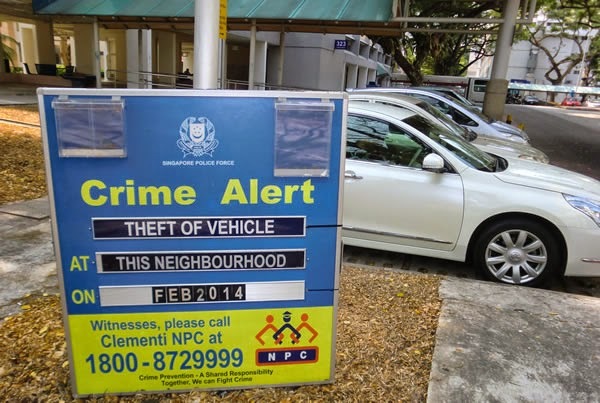 Vehicle thefts are rare & this is even more brazen as it take place at the carpark beside the train station which has electronic toll gantry collection. Those caught are just the tip of the iceberg. Even the campus is not spared. Meanwhile we've seen the emergence of security companies like Certis Cisco & Aetos which are govt-linked companies. Both enjoyed near monopoly status of the security business on this tiny island. Some of the police duties/jobs are outsourced to these 2 private companies. Why? Waste of taxpayers $$ to recruit more police amid the swelling population. Better to channel taxpayers $$ to these 2 govt-linked security companies for more profits. 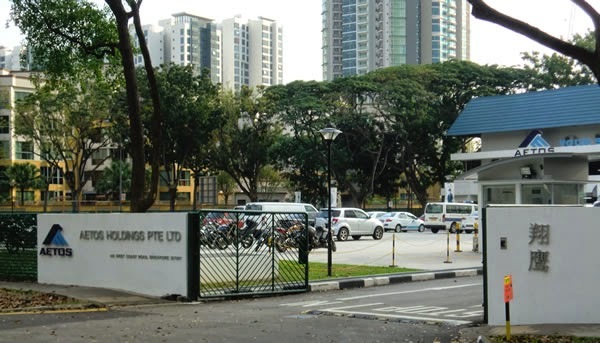 Aetos corporate HQ at Clementi West. Previously it is a school. Hiring police is waste of $$$. Hiring Aetos security guards is good profit by transforming taxpayers $$$ to profits of a privatised corpseration under the govt. Neglecting the public good is not what American founding father, Benjamin Franklin consider to be a good government. Late last year i wrote in blogpost Comparison Flood Pictures & Screwing the Peasants that the hybrid regime got no taxpayers $$$ to build footpath for peasants like you & me but $$ to build for minister to jog. In terms of public good whether it is police, hospital beds, public transport or footpath etc, it is not enough or get people to do it for free so the hybrid regime's bank account can be fattened even more. The more tax we pay, the worse in public good services we get in return. Blind supporters of the hybrid regime need to ask themselves why pay so much tax for deteriorating services? I agree with you. Free manpower! 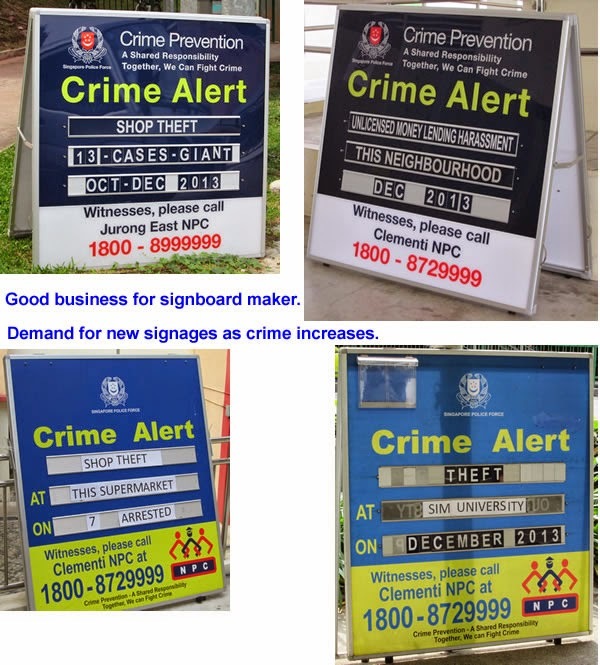 But then most ppl in sg won't realise they've been screwed.